Call It Spring has teamed up with your favorite fashion bloggers for an exciting event! Get a chance to win a PhP 5000 shopping spree at Call It Spring and a private shopping date with your favorite blogger on May 5, 6pm! Am I your favorite? Want to get some some one-on-one time with me? Then here’s how you can join! Like Call It Spring Philippines on Facebook. Click on the SWEEPSTAKES icon located under the cover image or simple click on this link to join the contest. Click “ENTER NOW” below the image and fill out your name, email, cellphone number and choose me as your favorite blogger. Remember, you must choose me as your favorite fashion blogger in order to qualify as my winner. Each fashion blogger will personally choose her winner from the list of people who chose her as their favorite. Deadline for entries is on May 3, 2012. I will be emailing my winner on the 4th so please make sure the email you provide is correct and that you check your inbox right away! If you’re not lucky enough to win, don’t you worry! 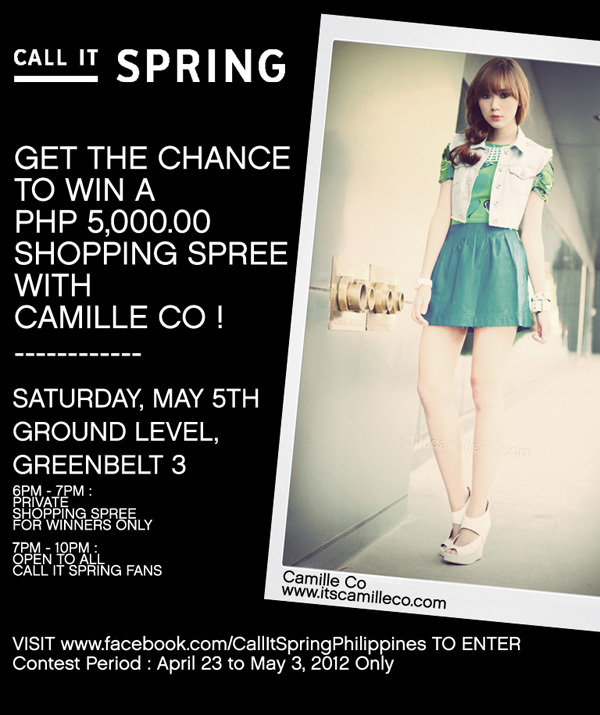 There’s still a meet & greet event open to all Call It Spring fans from 7pm – 10pm after the private shopping spree with our winners at Call It Spring, Greenbelt 3. You may not have won the PhP 5,000 shopping spree but you’ll still receive a 10% discount and meet all of us! Also, take advantage of the “True Romance” photobooth and free makeup touch-up services by The Face Shop at the event! Isn’t this exciting? I hope you join and choose me as your favorite! I’d love to meet you! I swear I’ll provide you with lots of fun and laughter! See you there! Hi Camille! :) Is there a winner already? You said that the winners will be notified thru email? What if the winner can’t go to the event, will she still be receiving a prize or not? I am just curious haha. Been reading the comments and I am amazed by how you have replied to them all despite of your busy schedule. You are blessed by God with a good heart, Camille! I really hope to shop with you. Whoa! Stay lovely! Good luck Frances! Happy birthday too! Thanks Eunice! :) See you there then! i hope i’ll win and get the chance to see you (one of the reason why i started blogging). I’m so flattered :) Thanks Stephanie! Good luck! you are my fave blogger ever!! muah! Awwwww thanks Xyla! That’s so sweet! kasi po I chose you..
i hope your smiling ms. camille. i really love your style you’re such an inspiration and you’re so pretty. It’s either I C U or U C me..
HAHAHA Lizel! The pokemon joke is so funny! :) Cute mo! definitely its camille co, nobody beats the “it girl” cheers! What?! A chance to meet you Ms. Camille? Whoa!I feel like I just won the lottery.!! yay! Haha thanks Pham! See you! Thanks Abbey! :) Good luck! I always adore your super posh chic style ate Camille! naki-ate?! :D hahaha! feeling close? I would just like to say you’re beyond amaziiiiiing! :) I hope I’ll win! *crossed fingers! Hahaha after this eventm close na talaga tayo! :) Good luck! Voted for you! :-) All the best! Thanks Deo! :) How great is the timing! See you! Oh wow! Happy graduation! Congratulations! :) Good luck! hi miss camille! the fb page don’t load well. I can’t join… huhu. Already filled up the form. Hi Camille, we met during Multiply Fashion show- but I guess you can no longer remember. Well anyway, what if you and Kryz are all my favorites. Can I send an entry each? Thank you! Thanks Rosevic! :) Gooooood luck! Go! :) I think Call It Spring is also trying to fix the problem with their page. Hopefully by today, it’ll work perfectly! Good luck Andie! :) See you! Sadly, I am unable to join as this is the same day that our cheering competition is going to be held :( I really want to meet you and I really need to buy a new pair of shoes too! Oh well, till next time, I guess. I joined the contest and I chose YOU! Yey! Sana mapili ako. =))) GV! Todo na talaga! See you there, Arvie! Done! Goodluck Ms. Camille Co! I'll spread it to my friends too. Thanks Camille! :) Good luck! i have been reading blogs before, but it was just then i enjoy it, and its after i read yours…hehe, and it makes you my favorite! its also my first time joining a blog give away so let’s all have fun and belated Happy Birthday to you (i heard ms pia guanio greet you last sunday :p)! God bless! Wow! I’m happy to be your first :) Naks! Thank you for the greeting as well! Can internationals join? It asked for cellphone number and I don’t have philippine no. haha..
Yaaaaay! Gooooood luck! :) See you! I hope I will have the chance to win one of your giveaways. I also joined the Big Blog Giveaway. Good luck Charisse! :) See you! Gosh … I hope after I hit “ENTER NOW” and then filled out my infos and auto-chose you as my favorite blogger; hit “SUBSCRIBE” then that’s it! Waaaah! No confirmation page … did I do it right? Nervous much! LOL. Good luck to me! Keeping my fingers crossed. (^_^) Pick me! Pick me! Hehe. Thanks Gladys! I like how you described my style haha! Sweet and spicy!